Tobias Suenner joined Opel in 1993. General Motors named former Opel engineer Tobias Suenner as president of its technical center in Shanghai. Suenner moves to the role June 1 from his current job as GM's chief engineer for compact cars. Suenner brings "a strong background in automotive engineering, including new energy vehicles, in both Europe and North America,” GM China President Matt Tsien said in a statement. 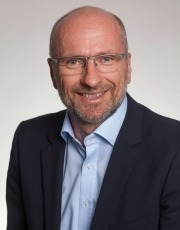 During a 22-year career with GM, which began at Opel in 1993, Suenner worked in Detroit and in Ruesselsheim, Germany, rising to executive director of vehicle development for GM Europe. He led development of electrical systems for hybrid and electric vehicles in Europe. Suenner will succeed Mark LaBaere, who will leave the center, which GM calls the Pan Asia Technical Automotive Center (PATAC), to join GM's global product development organization in the U.S.
PATAC, a joint venture between GM and SAIC Motor Corp, designed the Chevrolet Sail 3 subcompact, Buick Excelle compact sedan and the Buick GL8 minivan.